We’re still enjoying the last days of summer, but already the garden nurseries and craft stores are packed with fall décor. Fall doesn’t have to mean the end of your backyard paradise or outdoor entertaining! Our Nite Time Décor lighting experts have put together a list of ideas to keep your fall landscape lighting on point. Need more ideas or looking to update or expand your current outdoor lighting, give our team a call today! String lights have come a long way and are available in a variety of colours and styles. There’s sure to be something that matches the look you want or your existing outdoor décor. We think these are a fun and inexpensive way to change up your patio for fall that you can either remove for winter or move depending on the occasion or gathering. Like string lights, rope lights are available in an array of colours, which is great for seasonal entertaining. Some rope lights come with changeable light colours for maximum flexibility. Be sure if using rope lights that they are weather proof so you can use them all year long. If you’re planning a Thanksgiving, back-to-school, group or club kickoff, or just getting together to cheer on your favourite team, rope lights provide subtle lighting and double as safety lights highlighting changes in levels on patios and stairs or walkway borders. Who doesn’t love fabulous fall foliage. Placing downlights high up in trees can mimic moonlight or placing uplights on the ground can bring attention to the array of colours on display. But once the leaves drop, those lights can either be moved or left in place all winter to provide lighting with unique moving shadows on the snow. If you love Halloween, why not highlight those bare branches for a creepy look. If you don’t mind the bare branches, dimming the lights can give a romantic look. Consider adding frosted or coloured lenses to mute or add colour to your trees to create the mood you’re looking for. The days will be growing shorter soon and what better time to make sure of your outdoor lighting! Dark spaces don’t have to be creepy or foreboding. A softly-lit patio in an otherwise dark yard can create a feeling of an oasis and extended privacy. Enjoy an evening cuddled up under a blanket with a loved one and gaze at the stars. If you’ve gone all summer without pathway lights, chance are good that you’ve tripped, stumbled, or stepped where you didn’t want to. Pathway lights are not only a great safety feature, but they can add great contrast and highlight features (like gardens) often lost at night. Stake lights with hoods, or covers to point the light down, minimize the light that reaches your yard so you can focus on unique brickwork or paver patterns instead of blinding guests. We’d love to answer your outdoor lighting questions or help you design a truly unique lighting plan. There’s still plenty of time left to install outdoor lighting for fall entertaining. Contact Nite Time Decor Oakville today! Maximizing your living space is about more than renovating your basement. Have you looked outside for other possibilities? If you have a deck or patio space, you can extend your living space outside and create an inviting oasis you can even enjoy after the sun goes down with unique-to-you outdoor lighting. Our Nite Time Decor experts put together this list of outdoor lighting ideas that work well on any patio. If you don’t have an outdoor outlet, our team employs qualified electricians to ensure that all upgrades are done to code and done right the first time. We’ll take the worry out of installing electrical outlets and lighting fixtures across yards and patios. Outdoor pendant lights have been popular and continue to remain so with many low-cost options now available across a variety of retailers. Be sure the light is rated to be outdoors and water proof. Pendant lights are great for sitting areas, a dining table, or outdoor kitchen area. Choose a fixture that provides soft warm light or a brighter task lighting depending on your placement. Pendant lights are also great a focal point for your outdoor space. Don’t be afraid to be creative and try something new to really bring your outdoor space to life. Outdoor kitchens can be as simple as a bar-b-que or as elaborate as a brick oven or full kitchen set up with running water. You could almost include outdoor bars in with these as the lighting needs would be similar. These fixtures have always been popular, but maybe it’s time to take your outdoor cooking game up a level or two? You’ll be looking for fixtures that provide task lighting so you can tell how well done your food is, but you also want it to match the look of the outdoor space. Outdoor fireplaces are another fixture that’s popular in outdoor living spaces. These can be simple and utilitarian or elaborate and high end. You can cook by them or simply lay back and relax by the natural light of a contained fire. These are available in a variety of shapes and colours and utilize wood, gas, and other fuels. If a full-fledged outdoor fireplace won’t fit your space for whatever reason, there are a nice range of fire pits and bowls available as well. The added benefit to these fixtures is that they’re often easily relocated to a less conspicuous location during the daylight hours. This is a great way to have a fire when you want it and have the container be very stylish and match the rest of your outdoor décor—but not be in the way or obtrusive when not in use. Many outdoor spaces lack walls and can sometimes be challenging to create an eye-catching focal point. Do you have overhead beams, posts or pillars, something unique or interesting in your outdoor space? Do you have a wall with an interesting texture that would make great use of shadow and light? These might all be a great starting place to place some lights to highlight what’s already there. We’d love to answer your outdoor lighting questions or help you design a truly unique lighting plan. Contact our experts at Nite Time Decor Oakville to learn more about our lighting services or view our gallery of one-of-a-kind designs. Gone are the days where a floodlight and a lamppost by the front door is considered effective outdoor lighting. There are a whole range of outdoor lighting options that can incorporate safety, theft prevention and aesthetics. If you think of your home or business as a canvas – what textures, contrasts (shadow & light), and colour would you incorporate to create an appealing look? Let’s look at some of the enduring trends in outdoor lighting. Design follows function always. What do you need the lighting to do for your home or yard? Are you thinking of adding lighting just to the patio, looking to highlight the textures on the front of the house, or add security lighting around a pool? Each of these will use different fixtures installed for a different purpose. Don’t think you can’t combine functions. Yes, you can get attractive security lighting for paths or pools that’s attractive and highlights aspects of your yard you’re proud of. Just as an artist plays with textures, contrast, shadows, light and shapes, your outdoor lighting can be just as nuanced and varied to create a one-of-a-kind nighttime landscape for your home and yard. A great design evokes emotions, just as art does, so whether you’re looking to relax, entertain, celebrate, impress, or just extend your living space outdoors, your outdoor lighting can create a feeling that can serve many functions. LED lights come in a variety of colours, you can even change them out for different occasions. Want a Canada Day party and a Christmas light show, you can do that with the same fixtures. Gentle Transitions – Ideally, light from one zone doesn’t overpower or glare into another zone, but rather blends artistically without compromising safety lighting. Depth – Creating depth is easily accomplished by placing fixtures looking up a little farther from the object being lighted. The same goes for lighting placed overhead. Allowing the light to pass through moving foliage, for instance, is a great way to add interest. Focal point – Whether you have a bloom-covered gazebo or arbor, a fountain, pond or other feature, highlighting these at night and making use of shadows and contrast can create a dynamic focal point for your yard. Balance – Balance isn’t difficult to create because most of the time it’s simply symmetry. If you light the column on the right side of the door, also light the column on the left side of the door. If you light up a group of trees on one side of the pool, give the trees on the other side of the pool the same treatment. Balance means consistency and proportion with light and shadow. Safety – Lighting pathways, stairs, docks, pools, ponds and other features is important to keep family and friends safe. There are many fixtures that can provide enough light for safety and still create nice ambiance or serve another purpose such as lighting foliage or other features for aesthetics. We’d love to answer your outdoor lighting questions or help you design a unique lighting display for your home or business. Contact Nite Time Decor Oakville today! There are many benefits to a well designed and professionally installed landscape lighting system for your home or business. From the highlighting of key aesthetic features to increased safety and security, the impact of landscape lighting cannot be overstated. Like the rest of your home’s beautiful and functional features, landscape lighting is only beneficial if it is working. If your landscape lighting system is a few years old, chances are there’s components not functioning the same as they did when it was first installed. In cases where landscape lighting has not been updated or maintained, this may be especially true. Here are a few tips as we approach fall that can help keep your landscape lighting in tip top shape. When installing a new system, or even making some changes to an existing system, an important consideration is the location of the fixtures. A properly located fixture will be less susceptible to damage. Areas where people are frequently walking may not be the best places to place your lights. It is important to illuminate these areas, however fixtures should not be placed in locations where people are walking. Look for locations to place your fixture in a way that protects the fixture, but illuminates the areas where people will be gathering or walking. A second consideration related to location is the environmental effects. Consider things like rain, snow and wind along with effects from plantings. Look for areas that are protected from weather effects and possible damage from falling branches and leaves or even fertilizer placement. Awnings, eaves, or overhangs can provide protection which will help your fixtures last longer. If your fixtures are in a location where fertilizers are being used another helpful tip is to regularly apply glass protectors or look for ways to keep the fertilizers from contacting the fixtures. Another tip that will help to diagnose problems early and keep your lighting system functioning properly is to check it over regularly. This can simply be a walk around your property reviewing the landscape lighting fixture by fixture looking for any signs of damage. While doing this checkup it may help if you are able to do it at night with the system on, this will allow you to make sure they are properly cleaned and aimed correctly. One last tip to help you protect your lighting system is to take extra precautions when you are doing other yard maintenance. Things like pulling weeds, raking leaves, or mowing and trimming the grass can cause damage to your lighting system. Take extra time to point out your fixtures to anyone else you may have doing any yard maintenance on your property. 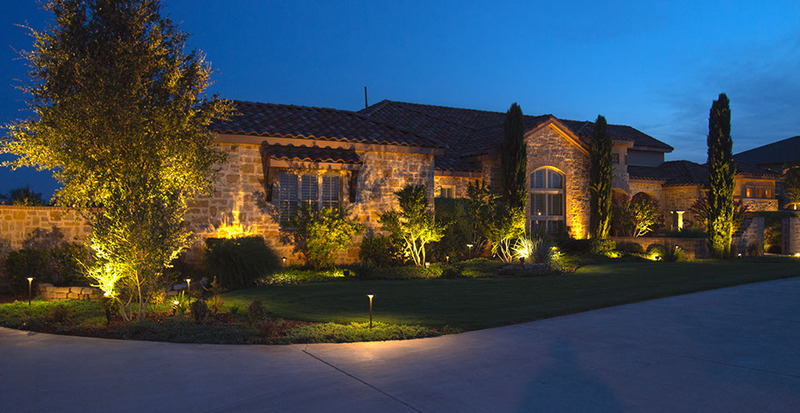 Protecting your landscape lighting system begins with a good design. Quality materials and proper planning are essential. Our team of landscape lighting professionals would love to help you make these important decisions. Contact us today to learn how we can help you design and install the landscape lighting design of your dreams, and how you can properly protect that investment for the future. With the recent heatwave, it is becoming more and more convenient to have an outdoor space for food preparation. Most homeowners have a grill as a minimum and these range from a small, simple propane or charcoal grill to expansive, multi burner grills with side burners and outdoor counter space. Proper outdoor lighting when it’s time to cook is essential, and as the days get shorter, this will be even more important. Here are some ideas from Nite Time Décor Oakville on how you can incorporate some outdoor lighting for your outdoor cooking spaces that can dramatically improve your enjoyment of the food preparation and dining. Placing a light above your outdoor grill is the best place to start. In order to cook properly on a grill it is essential to be able to see what you are cooking to make sure it is done before it’s removed from the grill. An overhead light is the best way to get enough light to cook properly on your grill. Your overhead (or task) lighting should be fairly bright with a true white light in order to see what you are cooking accurately. It’s also helpful to have this light on a separate control or a dimmer so that when the cooking is done you can have the right ambiance for a truly enjoyable dining experience. The lighting needs for an outdoor table are much different than the task lighting for food preparation. An outdoor dining area should be lit well enough to encourage conversation, but not so bright that it’s uncomfortable. Finding that right balance can be tricky and vary for different groups. We often install dimmers to make the lighting options more versatile and adjustable. One common solution for the dining area is an outdoor ceiling fan with speed controls and lights with dimmers. The fan can help to keep those unwanted pesky mosquitoes and flies away. Accent lighting can help to create the right ambiance in the dining area. Some ideas include under-counter lights. Some LED tape lights just under the edge of a counter can be a very appealing effect. String lights can also be used as accent or general lighting for that outdoor bistro feel. Wall sconces can also be added to highlight attractive outdoor architecture and add to the overall lighting plan. An outdoor cooking and dining space is wonderful this time of year. Not only do you get to enjoy this fabulous warm weather, but you can keep your house cool by cooking outside. Proper lighting for this outdoor space will make it attractive and welcoming for your guests as well as making food preparation more enjoyable and easier. If you are considering adding lighting to your outdoor space or if you are just designing your outdoor cooking and dining space and are looking for help with your lighting design and installation, contact the professionals at Nite Time Decor Oakville. Our experts can help you design a space that you will want to enjoy over and over again! Landscape lighting has many benefits for both business and homeowners. Outdoor lighting enhances your property’s natural and architectural beauty, increases security and safety, and creates a warm and inviting atmosphere for you and your guests. A well planned design can accomplish all of that and more. But maybe your fixtures are starting to look a little outdated or worn. Maybe you need an update on some fixtures. Where do you start? Things have changed significantly over the past few years when it comes to styles and lighting technology and it may be hard to make sense of all of the information that is out there. Here are a few ideas that may help you to determine how to upgrade and update your existing lighting system. A small change, properly done, can have a significant impact on your landscape lighting system. Have a look at the style of your existing fixtures. Is it still the look you are seeking? Updating the style of the fixtures can make your lighting system look fresh and current. New fixtures can also upgrade the performance of your existing outdoor lighting. If you’re updating your outdoor fixtures, maybe it’s time to convert some of them to LED. This can be done by replacing the existing halogen or incandescent bulbs with LED bulbs on some newer fixtures, or by investing in new complete LED fixtures where LED bulbs are not compatible. LED bulbs are typically brighter, have longer life expectancy, and are very energy efficient. Please be sure to review the owner’s manual and manufacturer recommendations for your fixtures before you replace the existing bulb with a LED bulb. If you are unsure, it may help to have an outdoor lighting expert review your existing fixtures and provide you with advice on what would be required to complete a LED conversion. It may be that you have done some renovations, adjusted your landscaping, or changed the exterior of your home. This is an excellent opportunity to review your outdoor lighting design and make any adjustments that you would like. Have a look at your current lighting system at night and take note of anything that you feel is not adequate or performing as you’d hoped it would. This is the best place to start. If you are not sure about how to proceed when it comes to reviewing your current outdoor lighting system and design, hire our professionals for the most current trends and products available within your budget. This is also a great time to expand an existing design. Have some great security and exterior lighting, now it’s time to treat your back yard or that new garden. The outdoor lighting experts at Nite Time Decor Oakville have extensive experience in the landscape lighting industry and would love to bring all of that experience to help you meet all of your outdoor lighting goals for your property. We can provide design advice, fixture selection advice and even do the installation for you. Contact us we would love to meet with you to discuss all of your outdoor lighting needs. Who doesn’t want to expand their living space outdoors in the warm summer months? Let Nite Time Decor Oakville help you light up your patio and go from blah to ahhh in no time at all!While aesthetics are important, outdoor lighting from Nite Time Decor will also improve safety and security for your family and guests. Decide on your focus. Do you have an idea of the kind of look or feeling you want to create with your outdoor space at night? Do you want outdoor lighting to mimic natural moonlight, provide functional lighting for cooking or reading, or just a calming glow to relax to in the evening? This little bit of research and thought will help you create the look and feeling you’ll enjoy for years to come. Under lighting is one way to light up your patio with flair. With LED lights, you can choose from a variety of colours that compliment what’s already there in your house or garden. Anything that’s stationary on your patio can be lit up from underneath with under lighting. Consider the patio itself with a string of perimeter lights under the edge. Lights under stair treads, railings, benches, planters, gazebos or ponds are all popular options. This lighting allows for ambiance that’s subtle but effective and also provides safety for guests by highlighting trip hazards. Natural outdoor lighting is very popular right now. Some favourite options include Tiki lamps, a gas-powered fire table, and moon lighting. Each of these will create a different feel for your patio. Uplighting placed among the foliage of nearby gardens can create interesting shadows and flickering lights at night. If your patio has trees nearby, placing down lights high up in the tree so the light shines down on the patio through the leaves is a great romantic lighting option. Wish you could step into your own oasis on your patio every night? With the right outdoor lighting from Nite Time Decor Oakville, you can achieve a mystical and enchanted space you’ll want to relax in and invite all your friends to experience. Small fairy lights hidden in foliage provide a soft glow hinting at magical gatherings. Moonlighting is also a great for mimicking that full moon experience every night of the month regardless of cloud cover. Wrapping trees with lights isn’t just for Christmas. In the summer evenings, this can lend a romantic and magical feel to a patio space. Add some twinkling lights to potted plants around the patio or deck to shimmer and wink as the evening wears on. String lights amid table top decorations provide low light perfect for late night chats. If you have a pool, underwater lights can lend a magical glow to the water you won’t be able to resist playing with the water sprites late into the evening. Begin constructing your perfect patio oasis with outdoor lighting services from Nite Time Decor Oakville. Receive your complimentary quote to start planning today!